We are not a hotel, and coming to a B&B or a gite goes hand in hand with seeking a unique atmosphere. It is the pleasure of establishing an easy, respectful and friendly connection with others that counts above all for us, like in a family. Les Marronniers opened as a B&B over 25 years ago. We hope to share with you our passion for B&Bs, this property and the region. If you find something missing, help us by letting us know. We hope that by welcoming you into our home, it might to some extent become your own . . . and that your stay will leave you with memories of good times spent around the breakfast table, in your comfy room, in the grounds with a good book, playing with your children in the forest, garden or meadow, or enjoying a magnificent sunset over the Dives valley. Staying in a B&B is also about sharing thoughts on life in general. Tell us about your region, your way of life, your garden, the last book you enjoyed, a special moment . . . The reason we chose to open up our house to visitors is so that it can be alive! Throughout your stay, we are on hand to listen to you, inform you, advise you, and help you have the most enjoyable stay possible. 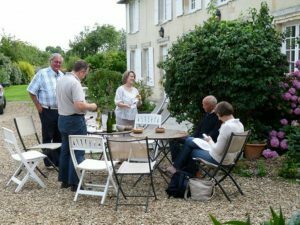 Les Marronniers is located in the heart of the Pays d’Auge region, which gives you the opportunity to discover the wealth of our region, to meet its inhabitants and of course to sample the many excellent local products. With its beautiful scenery, characteristic architecture, and very diverse tourist sites, from seaside to rolling hills, Calvados offers you a large variety of activities and places to visit. 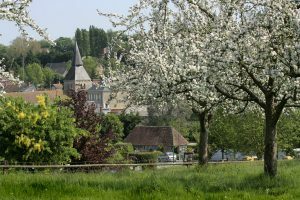 These include the Bessin territory with its famous landing beaches, the Pays d’Auge region and its half-timbered manor houses and horses, not forgetting the town of Lisieux with its St Therese Basilica. You will also discover Norman Switzerland with its remote gorges and picturesque valleys, Bocage Virois, which is an area popular for woodland walks and river fishing, Caen and its surrounding area, and the town of Falaise, a historic Norman landmark and fife of William the Conqueror. Please be considerate of your neighbours, especially at night… or early in the morning. The key allows you to be independent; you will keep it until the end of your stay. On the day of departure, please leave it in the lock or hand it back to us personally. Our house is entirely non-smoking. We kindly ask you to smoke only in the park, we have ashtrays, do not hesitate to request one. The bedrooms are available from 5.30 pm. In the morning, please free the room before 11 am so that it may be cleaned, for you or for the people who will use it after you. It is also possible to use the pantry refrigerator to store some food, drinks or ice packs. It is done daily in the « guest rooms », upon each new guest arrival, but also during your stay if necessary. Do not hesitate to report any malfunction issue, or request new bathroom towels. In the self-catering cottages, the cleaning is done prior to your arrival and the final cleaning is up to you, though we may do it for you at extra cost. On arriving you may bring your car close to the building to unload your luggage, afterwards please park it at an angle to the entrance of the property, so that everyone finds a space on arriving. It is served from 8.45 am to 10 am. You have herbal tea, tea or coffee at your disposal in the bedrooms; remember not to put down your cups directly on the furniture. We have installed a large water treatment unit for the guest house and the cottage. As a result water is now softened for added comfort in the bathrooms. On the other hand, softened water means new attitudes: you can use less soap or foaming products; and even if it is fit for drinking, salt-sensitive people should be careful. We have replaced the heating system and installed a heat pump and a new condensing boiler. We were thus able to connect the guest rooms to the central heating system for optimum comfort throughout the year. The cottage is fitted with electric heaters. There as well, we replaced the devices for extra comfort, notably in the lounge with thermal fluid heaters. During the day, leave the heaters set to 2 or 3, and turn them up as required when you are present. Some bins are at your disposal. As we sort the waste, please keep the glass and cardboard separate. We kindly ask you to take your bottles to the appropriate bottle banks in the village. Please be respectful of outdoor areas, so that everyone may enjoy them. We do not accept pets in the guest rooms; thank you for your understanding. It is accessible from the patio and the guest rooms. After all these recommendations which may seem: Useless, obvious or drastic… but which one feels necessary to put down in writing, for the sake of everyone’s well-being.